It’s been a busy day today as far as Google is concerned, and alongside the all-new Nexus 6, the Mountain View outfit has drafted in the services of Taiwan-based HTC for its next major tablet. With the Motorola-made Nexus 6 set to be the first handset running on Android Lollipop right from the get-go, the Nexus 9 will follow suit for the larger occupants of the mobile world, and given that it’s made by HTC – designer of some highly-regarded smartphones over the past couple of years as you may recall – we’ve been very intrigued to take the wraps off this particular slate. Now, Google has put paid to the rumors, offering glimpses of the tablet as well those all-important specs, and here, we dig through them all to see if it has justified the hoopla. With this tablet, it’s clear that Google is looking to rival the likes of the Microsoft Surface rather than, say, Apple’s iPad, and given its hardware, accessories and price point, it could really ask a question of those tabs running on Windows 8.1. Let’s not mince words here, the Nexus 9 hasn’t been beautified by HTC to anywhere near the same degree as the One M7 or M8. But by the same token, it’s important to remember that smartphones and tablets are still inherently different despite their close links, and if you’re an appreciator of nicely designed slabs, the Nexus 9 is most certainly one of them. As for colors, you can opt for the fairly standard black or white, as well as a rather odd "sand" beige color which, we have to admit, doesn’t really float our boat. If you’re not fond of it either, then that’s just as well, since it won’t actually hit the market until later on in the year. With a 4:3, 8.9-inch QVGA display boasting a resolution of 2048 x 1536, this device is made to be both productive and versatile, and although it’s always dangerous to cast aspersions about any tech product by looking at on-paper specs sheets, we’d expect a fairly sharp, high-performing panel in reality. The Nexus 9 includes an 8-megapixel rear-facing snapper as well as a 1.6-megapixel front shooter, and although, again, it’s hard to make too many judgments at this point, it’s likely that they’ll both offer competent, if not spectacular performance. 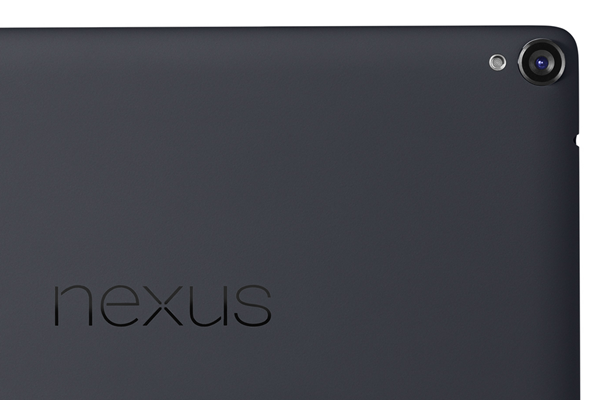 The key feature of the Nexus 9 is its power. I drew those Surface comparisons earlier on because, unlike most Android tablets and phablets, the processor is comparable to those productivity-centric "pro" device. Under the hood, you get a 64-bit NVIDIA Tegra K1 processor clocked at a healthy 2.3 GHz, 2GB of RAM and Kepler DX1 graphics. You get 16GB or 32GB of on-board storage as standard, but unfortunately, there’s no way of bumping this up via microSD. This is where those running a Windows machine might decide against going for the Nexus 9, for adding extra memory is as simple as popping in a USB thumb drive. The Nexus 9 includes a 6,700 mAh battery, which, Google claims, will keep the tablet running for some 9 hours. The usual suspects will surely test the living daylight out of the device over the next few weeks in an attempt to substantiate / refute these claims, so we’ll keenly await those, but for a powerful, 64-bit tablet, those figures are rather impressive. 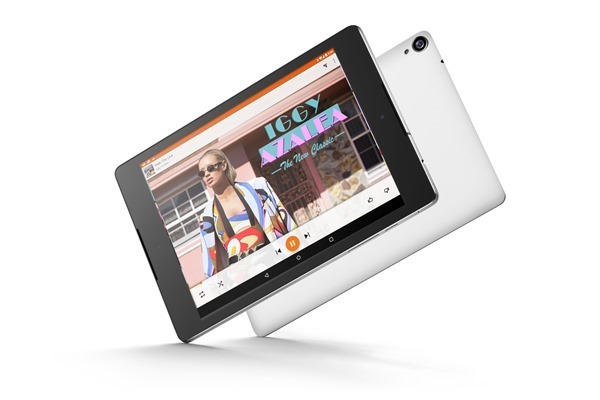 The Nexus 9 reaps the benefits of HTC’s BoomSound technology, and although we’ll reserve definitive judgments until we’ve had a hands-on, our past experiences with BoomSound have been very favorable indeed. 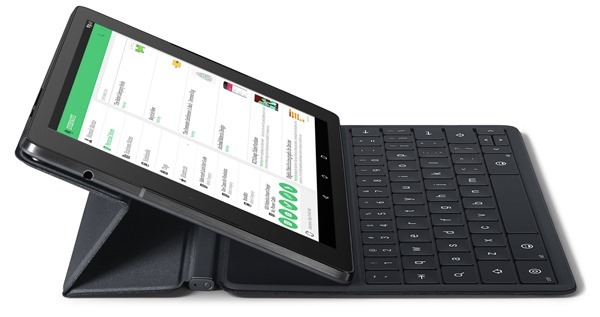 There’ll also be an official keyboard attachment that clips onto the Nexus 9 magnetically, and essentially allows you to morph the device into a traditional notebook. Alongside the Nexus 6, will be running on Android 5.0 Lollipop out of the box, and we’ll have the full low-down on that particular side of today’s announcements in a few moments. 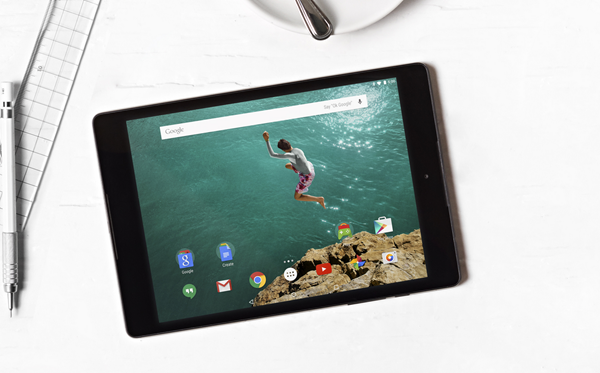 The Wi-Fi-only Nexus 8 will start at $399 for the 16GB variant, or $479 for the 32GB. There’ll also be an LTE model for $599, which will arrive only as a 32GB option. 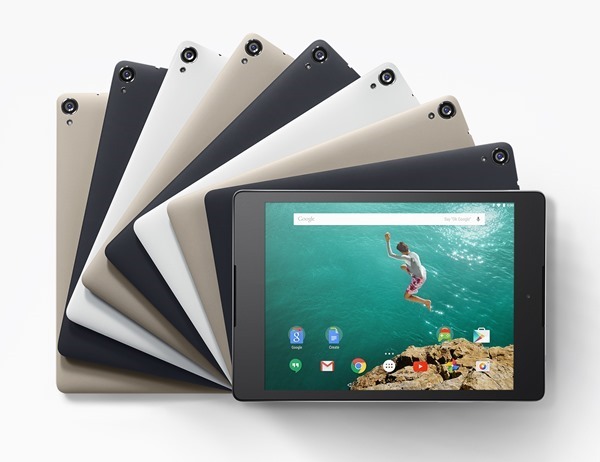 Nothing solid has been disclosed as yet, but the Nexus 9 will arrive in 29 countries over the next few weeks, and pre-orders will start on October 17th. U.S. retail outlets will include Best Buy, Gamestop, Office Depot and others, as well as the Google Play Store, and as and when we gather further info regarding the Nexus 9’s retail début, we’ll have the details right here. “complete set of tech. specs of the device”? Four entries? What about: Bluetooth, NFC (front/rear antennas like the Nexus 10), Qi inductive charging, Wi-Fi standards supported (802.11a/b/g/n), image stabilization for the rear camera, PPI of the LCD, etc? 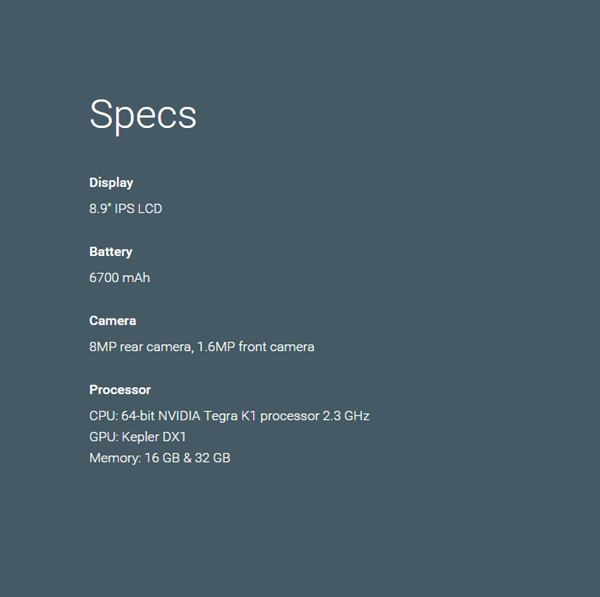 The specs listed are far from complete. Lack of expandable memory is a killer for me…. Neither has any iPhone or iPad, the true appeal of the device is the updated specs, stock android experience, and access to Lollipop updates first. I’m glad this 9″ form is coming out.